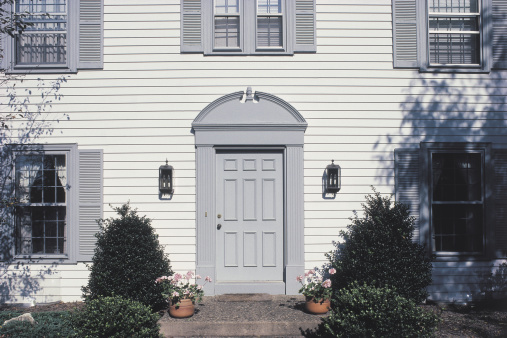 Schlage is the leading producer of keyless entry systems for residential entry doors. Their most popular keyless entry lock-sets use a 10-key mechanical keypad that opens the lock when you push buttons to enter a 4-digit code you program into the lockset. This type of lockset can store up to 19 different individual codes, allowing you to set temporary codes to allow access to your home by babysitters, service professionals, or others to whom you want to give temporary access. You can enable or disable any one of these codes whenever you want. 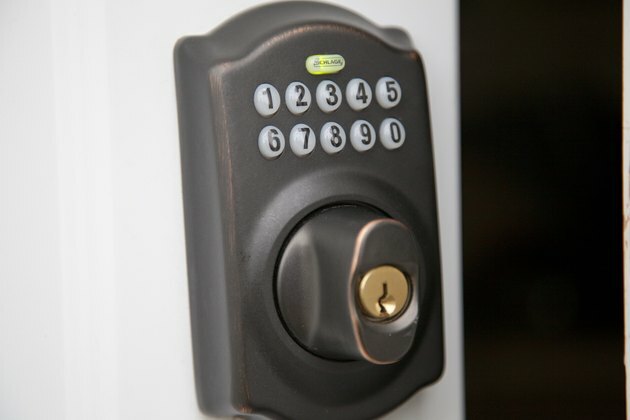 The most common Shlage keyless entry has a "Schlage" button and 10 numerical keys. Schlage's newer generation keyless entry systems replace the mechanical push-buttons with touchscreen buttons. And in the most recent versions, Schlage keyless lock-sets use blue-tooth and wireless systems that allow you to program and operate the lock with a smartphone, or by voice activation using Amazon Alexa or a similar system. On these electronic models, you can store as many as 33 different individual user codes. From time to time, you will need to add or delete the user entry codes on your lock-set. 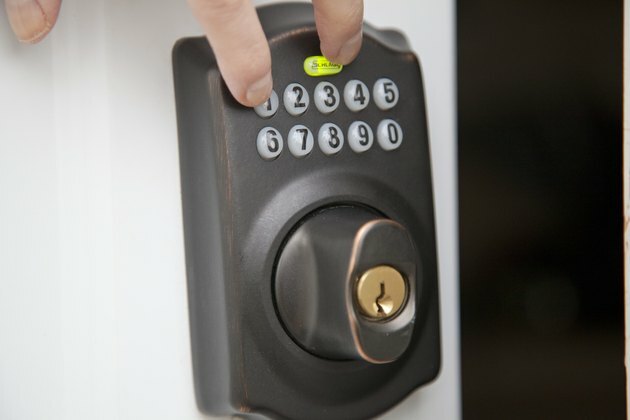 For example, if you've moved into a new home equipped with a Schlage keyless entry system, you obviously will want to cancel out all existing codes and program new ones for your family. Fortunately, although Schlage keyless entry systems come in different types and many different styles, the user entry codes are programmed in pretty much exactly the same way. The instructions shown below are based on the standard push-button keyless lock-set. Before getting started, though, you need to get familiar with the layout of the keypad and the code system. There are two types of codes you'll need to understand. First, there is a six-digit programming code that is used to activate the programming features of your lock-set. Entering this code will be the first step to programming individual four-digit user codes. Your lock comes with this code preset, but you can also change it to a code of your choosing. There are also four-digit user codes. These are the routine codes that will function as the "keys" to open your lock in daily operation. The outer face of the keypad has 10 digit buttons, plus a "Schlage" button located at the top of the keypad. The number keys will be used to enter both the six-digit programming code and the four-digit user codes. 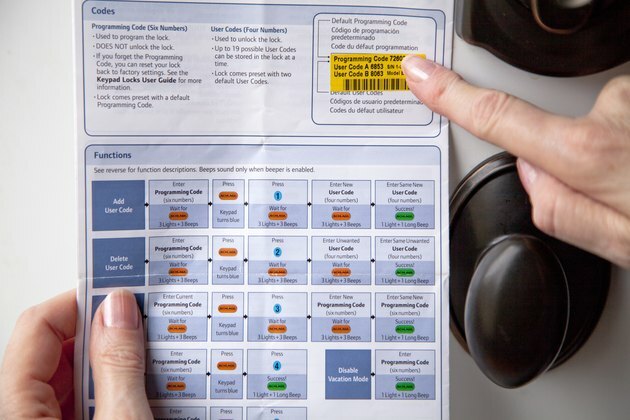 The Schlage button is used only when programming the various codes—not in routine daily use. Schlage + 1: The keyset is primed to enter a new 4-digit user code. Schlage + 2: The keyset is primed to delete an existing user code. Schlage +3: The keyset is primed to enter a new 6-digit programming code. Schlage +4: The keyset temporarily disables all user codes; or activates all user codes if they have been disabled. Schlage +5: The beeper function is disabled or enabled. Schlage +6: All user codes are deleted at the same time. The programming code is printed instruction sheet. 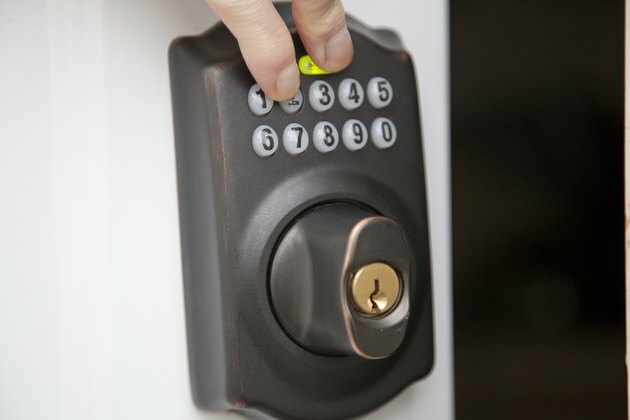 Locate and write down your Schlage keyless entry's six-digit programming code. This will be the first code you enter, and will activate the lockset to allow you do do all the programming. The original programming code is located either on the yellow sticker on you keyless lock-set's installation instructions, or the back side of the deadbolt lock. Amber or orange flashing light indicates the lock is ready to program. Enter this six-digit programming code using the number keys on the keypad. Wait for the "Schlage" button to flash amber or orange and beep three times. The "Schlage" button will remain illuminated to indicate the lock ready for reprogramming. Use the following instructions to perform different programming functions on your lockset. Pushing the Shlage button and the "1" key primes the lock to accept a new entry code. To add a new entry code, press the "Schlage" button and the number "1" button simultaneously to add a new entry code. Wait for the "Schlage" button to beep and flash three times. Green flashing light indicates the keyless lock is ready to be programmed. Enter a new four-digit code, and wait for the "Schlage" button to flash and beep three times. Re-enter the same four-digit code to confirm the change. The "Schlage" button will beep a long beep and flash green to indicate a successful reprogramming. Schlage keyless lock-set being programmed. To remove an entry code: Enter the six-digit entry code, then press the "Schlage" button and the number "2" button simultaneously to remove a previous entry code; the "Schlage" button will flash and beep three times. Enter the four-digit entry code you want to remove— the "Schlage" button will flash and beep three times. Re-enter the same four-digit entry code for confirmation. The "Schlage" button will beep one long beep and flash green, indicating a successful deletion of your previous entry code. Enter the existing six-digit code. Press the "Schlage" and then the "3" keys. When three orange flashes and three beeps occur, enter a new six-digit code. When three orange flashed and three beeps occur again, reenter the same new six-digit code. When light turns green, new program code has been entered. Enter the six-digit programming code. Press the "Schlage" and then the "4" keys. All codes are now disabled. To reactivate all codes, repeat steps 1 and 2. Press the "Schlage" and then the "5" keys. The lockset's beep function is now disabled. To restore beep function, repeat steps 1 and 2. Press the "Schlage" and then the "6" keys. All codes have now been deleted, and new ones will need to be programmed.